The Belgian School at Athens represents expertise on Greek Archaeology in Belgium and is the official institution in Greece that allows Belgians to conduct archaeological activities in Greece. It is a cultural and scientific embassy, within the large network of foreign and Greek scientific and cultural institutions in Athens. Under the aegis of the Belgian School at Athens, three excavation projects are currently undertaken by a total of five Belgian universities. 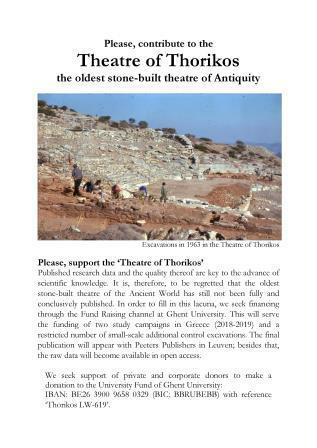 The classical site in the Lavrion area of Attica, Thorikos is today under investigation by Prof. Roald Docter (University of Ghent) in collaboration with Prof. Robert Laffineur (ULiège) and Dr Sylviane Déderix (UCLouvain). The prehistoric site near Sissi on Crete, is an excavation project and an initiative of Prof. Jan Driessen (Université Catholique de Louvain). The site of Itanos on the east coast of Crete is being excavated under direction of Profs. Didier Viviers and Athéna Tsingarida (Université Libre de Bruxelles). Belgian and foreign academics attached to Belgian universities have collaborated with and directed numerous projects under foreign aegis. This can be demonstrated by Prof. Driessen, who worked previously at Malia (under the Ecole française d'Athènes), at Knossos and Palaikastro (under British School at Athens). The former director of the School, dr. Soetens has worked for several years in collaboration with the Institute of Mediterranean Studies, with the British School at Athens, with the Netherlands Institute of Athens, and the Ecole franηaise d'Athθnes. Also profs. Laffineur and Viviers have had or are currently still involved in collaboration with the Ecole française d'Athènes. 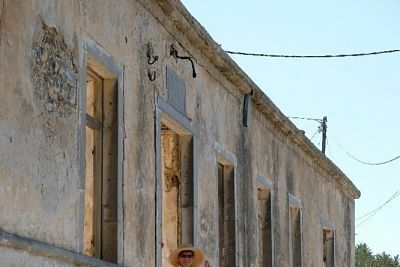 Publications of Belgian archaeologists, working in Greece are of excellent quality and appear regularly in prominent and peer-reviewed scientific journals, publications. Famous belgian series in their own right are Aegaeum,Kernos, Thorikos Series. We are proud of our present projects, but need more support to be able to grow. Our "school" currently resides in rented facilities shared with the Netherlands Institute at Athens and works on a limited budget from Belgian Federal Science Policy. The Committee "Belgian Centre of archaeological research in Greece" resides at the Royal Musea of Art and History, Brussels, of which the members are active and passive academics from most Belgian Universities and the Royal Musea. At Thorikos the Mycenaean tholos tombs have to be consolidated, and all sites must be maintained and scientific publications prepared. Information panels must be placed at all sites, students and staff should have a place to stay and study in Athens. The existing library, archaeological notebook archive, photo-, plan- and drawing archive must be updated, enlarged, digitised, placed online. The Belgian School at Athens needs your support, to be able to provide the necessary backbone to its projects in Greece. You can help us by supporting us financially, by donating via clicking the following link: https://www.uclouvain.be/474671.html. If you would rather consider helping us in material or in any other way, do not hesitate to contact us on info@ebsa.info. High up in the village of Vrachasi stands the Old School, built in 1865 but abandoned in the 1970s. The Sissi Archaeological Project and the Belgian School at Athens have received it in concession for a period of 30 years from the local community and we want to restore it and turn it into a research centre for the archaeological projects in the area but also into a cultural centre for lectures, exhibitions and concerts. We highly appreciate your support. All donations – also very small ones – are welcome but donations of 40€ and more can be used to receive tax deductions. If you want to receive a paper at the end of the fiscal year, please contact us. Published research data and the quality thereof are key to the advance of scientific knowledge. It is, therefore, to be regretted that the oldest stone-built theatre of the Ancient World has still not been fully and conclusively published. In order to fill in this lacuna, we seek financing through the Fund Raising channel at Ghent University. This will serve the funding of two study campaigns in Greece (2018-2019) and a restricted number of small-scale additional control excavations. The final publication will appear with Peeters Publishers in Leuven; besides that, the raw data will become available in open access. We seek support of private and corporate donors to make a donation to the University Fund of Ghent University: IBAN: BE26 3900 9658 0329 (BIC: BBRUBEBB) with reference ‘Thorikos LW-619’.